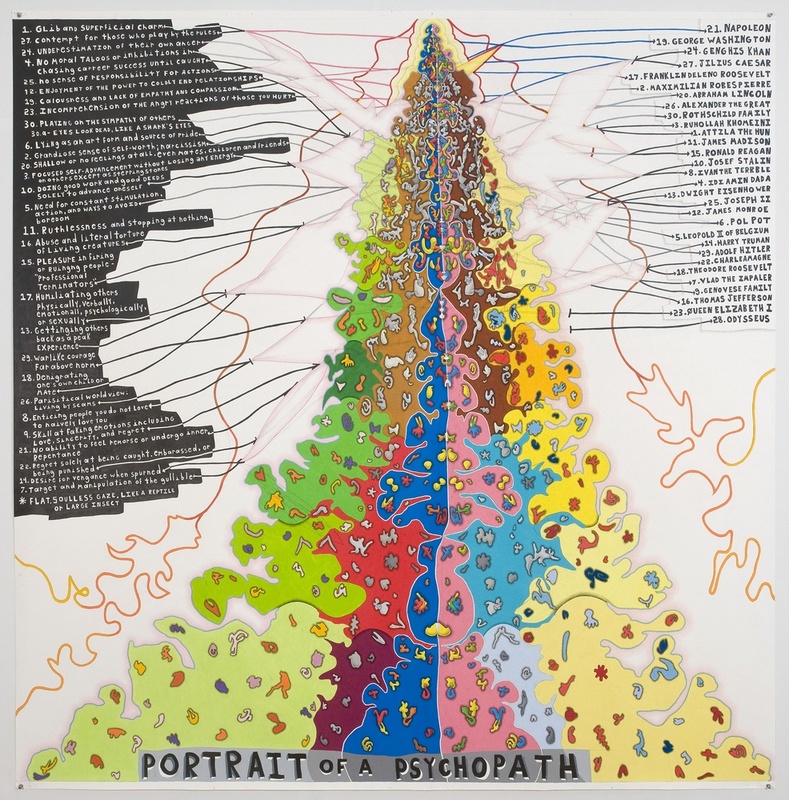 In this piece, I was thinking about the relationship between psychopaths and famous political leaders (the qualities that make a successful leader are often psychotic in nature), and about the mutation of psychopathic attributes over time, and within a species. On the left side of the piece, I listed a hybrid version of the clinical checklist for psychopathy, culled from various sources. I then connected these attributes (with physical lines) to the names of the most evil leaders throughout history, and the most successful presidents in US history, as anointed by internet voters. After linking these psychological attributes to my polarized list of historical leaders, I began to deconstruct these same links with the abstract forms in the center of the piece, which grew outward, organically. I drew a set of smaller shapes intuitively, trying to channel negative or positive energy through each, psychically. I then drew a dividing line down the center of the group - like a polarizing spine. I then began to copy these shapes, reversing them and redrawing them on the opposite side of the dividing line. The copies are more direct and specific around the spine, and more diffused and less exact as they move away towards the perimeter – like a magnetic field that weakens. Ultimately, these shapes were, to me, something akin to insects or bacteria that reproduced, mutated, or evolved across a field. They eventually invaded the text.